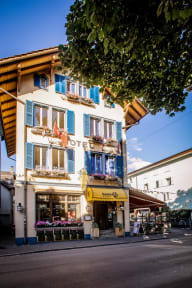 Located just 5 minutes walking distance from Interlaken West-Station, the lodge is the best starting-point for adventure and sports in summer and winter. Our bar and restaurant, the 'Brasserie 17' is Interlakens N 1 spot for food and fun! From September - June we organize every Thursday night live concerts in our bar. You are able to arrive and check in anytime from 6:00 -12:00 a.m and 1:00 p.m. - 01:00 a.m. The rooms are ready from 3:00 p.m. (when you arrive earlier you can leave your your luggage in our luggage room). Our Bar & Restaurant, the Brasserie 17, is the place where young locals and travellers meet and feel at home. From September to June we organize every Thursday night a live music concert. -> Party time! paragliding, hanggliding, skydiving, river rafting, canyoning, bungy jumping and ice climbing.